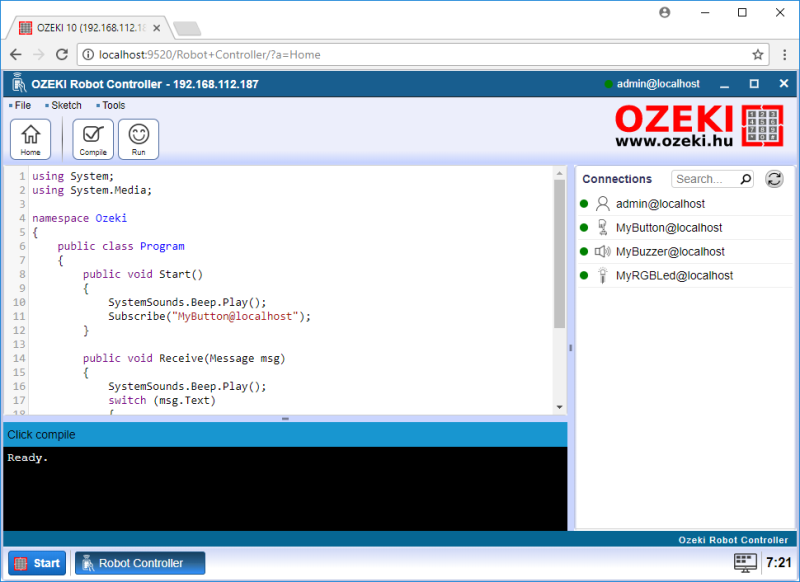 The Ozeki Robot Controller App in Ozeki 10 makes it very easy to build robots and smart, automated systems. It allows you to communicate with your sensors and actuators using simple text messages. You can write custom logic in C#.Net to manage your system's behaviour. Sensors can be connected to your system using a data cable (USB, RS232, RS485, I2C, SPI) or over the network (Ethernet, TCP/IP). Ozeki 10 runs on desktop Windows or Linux systems and ARM based embedded/single board PC's, such as the Raspberry Pi. It can also be installed on Android Smartphones, so the smartphone specific connections can be easily added. On the following screenshot you can see the Robot Controller App's graphical user interface (GUI). There are three main secions in the screen: the main code editor window, the execution log (black section) and the list of available sensors and actuators on the right side of the user interface. Find the best examples and solutions for your needs.